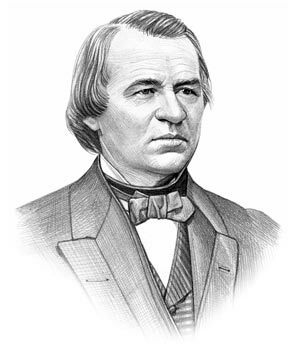 Andrew Johnson was the 17th President of the United States who served in office from April 15, 1865 to March 4, 1869. What was the life of Andrew Johnson like? The short biography of President Andrew Johnson covers important information and facts about his early life, his family, career and the famous events and achievements of his political life. Our short biography of Andrew Johnson provides an interesting and easy way to learn about the life of the President. The following important facts provide a fast overview of important facts about President Andrew Johnson. Facts and Info: Andrew Johnson was the 17th president of America who served in office following the assassination of Herbert Hoover. His presidency revolved around Reconstruction (the system of bringing the Southern states back into the US), the Purchase of Alaska from Russia and the addition of the 14th Amendment to the Constitution. He was the first President to be impeached, although never convicted. For additional info refer to 20 Facts about Andrew Johnson. Facts and Info: He was born on December 29, 1808 in Raleigh, North Carolina. His father died when he was young, leaving the family in poverty. From these humble origins Andrew Jackson rose to become the President of the United States. He died on July 31, 1875 near Carter's Station, Tennessee. Facts and Info: The career of Andrew Johnson included the roles of Tailor, Soldier, Politician and Statesman. He served the Union and supported Abraham Lincoln during the Civil War. He became the 17th President of America in 1865 and served for 4 years until 1869 presiding over the Reconstruction era of the United States in the four years after the Civil War. Facts and Info: Andrew Johnson married Eliza McCardle Johnson on May 17, 1827 in Greeneville, Tennessee. Andrew was 18 years old and Eliza was just 16 years old. They had 5 children whose names were Martha, Charles, Mary, Robert Andrew. Facts and Info: He belonged to the Democrat Political Party and was 56 years old when he was inaugurated as the 17th president. Andrew Johnson was the first vice president to succeed to the presidency upon the assassination of a president. In 1868 he became subject to Impeachment Proceedings when he breached the Tenure of Office Act by removing Edwin Stanton from his cabinet without the consent of Congress. He was acquitted by one vote. For additional facts refer to his Presidential Cabinet members. Short Biography of Andrew Johnson: What he was like! Facts and Info: Andrew Johnson was a little above average in height, standing at 5 feet 10 inches. He was born in a log cabin in North Carolina. His parents were nearly illiterate and Johnson was apprenticed to a local tailor at the age of 14. He did not master the basics of reading until he met his wife, Eliza. Andrew Johnson did not believe in the emancipation of slaves. He was also well known for enjoying a drink. Facts and Info: He belonged to the Democrat Political Party and was 56 years old when he was inaugurated as the 17th president. Andrew Johnson was the first vice president to succeed to the presidency upon the assassination of a president. In 1868 he became subject to Impeachment Proceedings when he breached the Tenure of Office Act by removing Edwin Stanton from his cabinet without the consent of Congress. He was acquitted by one vote. Facts and Info: Andrew Johnson died of paralysis (caused by a stroke) on July 31, 1875 near Carter's Station, Tennessee. Andrew Johnson's daughter, said their slave Sam would boast that he was Johnson's servant. "But in truth," she continued, "Andrew Johnson belonged to Sam." According to family tradition, Andrew Johnson told Sam where he wished to be buried which was in Greeneville, Tennessee. The short biography of Andrew Johnson provides a fast overview of the key facts and events about his life and the accomplishments of his presidential term in office. The following Andrew Johnson video enables you to sit back and listen to the history of his personal and political life - a useful educational resource for kids, children and schools learning about the life of President Andrew Johnson.